JOHNGY'S BEAT: Oh Baby, Where Are You? Oh Baby, Where Are You? In October of 2005, when most people in Houston were glued to their televisions watching the Astros play the Chicago White Sox in the World Series, my family and I went to see the Houston Aeros host the Chicago Wolves. We bought the tickets way ahead of time and had great seats. Besides, who would have thought that either (let alone both) Houston and Chicago would be in the World Series? The wolves won the game, but our main focus was on Stephen Baby, right winger for the Wolves. We decided to cheer for him throughout the game. For Baby (and for us), it turned into an odd game. Baby didn't get much action in the game. In fact, through the first period, he only touched the ice once and that was only for a second, as a penalty occurred and Baby was called back. At one point in the game, he wasn't even sitting on the bench. He was sitting on an overturned bucket. I don't know if the Wolves had too many players or if the team benches in Houston are short. Either way, there was Baby, sitting on a bucket, waiting to get some ice time. 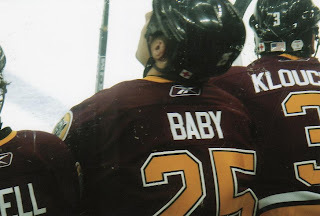 Early in the 2006-07 season, the Wolves traded Baby to the Tampa Bay Lightning organization. He finished the year with the Springfield Falcons. He was never heard from again. Well, that might be too much drama, but seriously, I have no idea where he went after that season, nor where he is today. Stephen Baby in the Toyota Center in Houston, TX-October 2005. Great song. Very memorable melody. Applause!